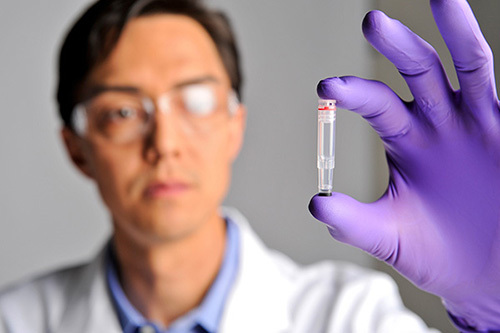 A Thermo Fisher scientist hold an NGS sample vial. Developers of next-generation sequencing (NGS)-based diagnostics breathed a sigh of relief in March, after months of clashing with the Centers for Medicare & Medicaid Services (CMS) over NGS testing reimbursement for Medicare and Medicare Advantage patients with advanced cancer. CMS rattled test developers in November with a draft National Coverage Determination (NCD) that limited Medicare coverage to FDA-approved NGS panels for the most advanced oncology patients. Diagnostic companies argued that numerous clinical applications of NGS within oncology are not directly related to therapy selection, and that NGS-based testing is used in numerous other areas outside of oncology. “The concern among the broader industry was that this could actually nip in the bud all of the interesting developments in clinical diagnostics based on NGS before it’s even really starting to flourish,” Charles Mathews, principal with ClearView Healthcare Partners, a global strategy consulting firm serving the life sciences sector, told Clinical OMICs. However, when CMS issued its final NCD on March 16, test developers’ fears turned mostly to cheers. The final coverage determination expanded eligibility for Medicare reimbursement by adding coverage for patients with Stage III metastatic, recurrent, relapsed, or refractory cancers, in addition to the Stage IV relapsed or refractory cancers included in the draft NCD. The final NCD also included repeat testing when a new primary cancer diagnosis is made by the treating physician and the patient meets other clinical criteria. As outlined in the draft NCD, it removed coverage with evidence development for tests not authorized by the FDA. The action by CMS followed a concurrent FDA review of Foundation Medicine’s FoundationOne CDx comprehensive genomic profiling assay through the agencies’ Parallel Review Program. FoundationOne CDx is designed to detect substitutions, insertion and deletion alterations (indels), and copy number alterations in 324 genes and select gene rearrangements. The test also detects genomic signatures, including microsatellite instability (MSI) and tumor mutational burden (TMB) using DNA isolated from formalin-fixed paraffin embedded tumor tissue specimens.